Often, in the midst of chasing all that is bright and shiny and new, we tend to overlook the old faithfuls. The ones that are so solid and dependable, they become almost like furniture – you find them useful, but you won’t notice them till they’re gone. This is how I felt about the Shiseido Rouge Rouge Lipstick. Shiseido Rouge Rouge lipsticks were introduced a couple of years back. I believe that they replace the Perfect Rouge line, which happens to be one of my favourites. I however, did not try these till fairly recently. And when I first slicked them on my lips, it was like coming home. The quality is sublime. The texture glides on like smooth cream. The opacity was fully opaque in one swipe from the tube. There was no scent. And the reds, oh the red lipsticks! 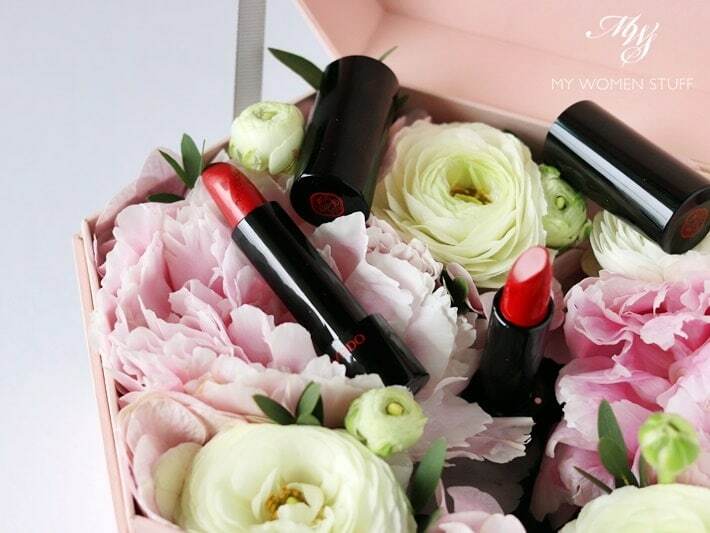 Shiseido Rouge Rouge lipsticks are supposed to be a lipstick formula that offer rich, vibrant colour with rich moisture. They come in sleek, understated black tubes, that have a lovely heft to them. The cover clicks with a strong magnet that reminds me of Giorgio Armani lipsticks. There is a quiet, understated elegance about these lipsticks. They remind me of an exclusive club that many know of, but few are privy to. Owning one of these lipsticks is like joining this exclusive club. You enjoy its benefits, but you don’t really shout about it to the world, because it just seems crass to do so. But I’m going to invite you to join me in this exclusive club, because the texture and formula is so stunning, it would be a waste not to try it! The stars in the Shiseido Rouge Rouge lipstick range are of course, the rouge (red) lipsticks. There are presently 16 shades of varying tones of red to quite literally suit every skin tone. There are some that lean a little more pink, or that lean a little more brown. But it is otherwise, predominantly red. And I know that many of you are still afraid of wearing red lipstick, despite my constant urging LOL! It is a lip colour that few dare to sport, because it is just deemed to be “too bright”. And really, what’s wrong with that, I ask you? Don’t be afraid to be bold, and be bright. Quite often, you may realise that not many people notice or actually care. We are the ones limiting ourselves and holding ourselves back! The first is RD307 First Bite. I’ve been wearing this quite often, and to me, this is a very wearable red, as the shade is a little lighter in tone. There is also a shine to it. You can wear it a little more sheer (apply to lips, then blot and dab some gloss or balm over) if the colour intimidates. But otherwise, it is a wearable rosy red that I personally find very flattering. The other shade RD501 Ruby Copper is bolder. I personally find the texture more opaque in one swipe, and it is a blue-based creamy red. I personally take to wearing blue-based reds better, as I find it suits my skintone better so this colour is definitely one I gravitated to. If bold reds aren’t your thing, then you might shy away from this one as it is decidedly a bold red. Beautiful, but bold. Ok, if you really want to be picky, RD307 First Bite has a slightly warmer tone, while RD501 Ruby Copper is most definitely cooler in tone. But really, these pictures only serve to show you that they are beautiful red lipsticks that are creamy, not drying, long lasting, and do not travel or smear. They are absolutely worth a look! 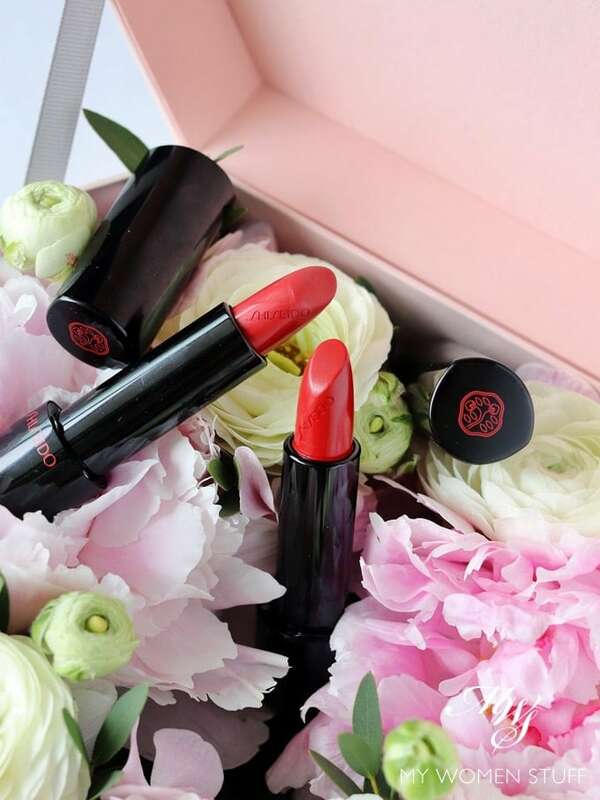 Have you tried the Shiseido Rouge Rouge lipsticks? NEXT POST: When people talk about having “good skin” do they really mean having “young skin”? This is definitely my favourite lipstick! 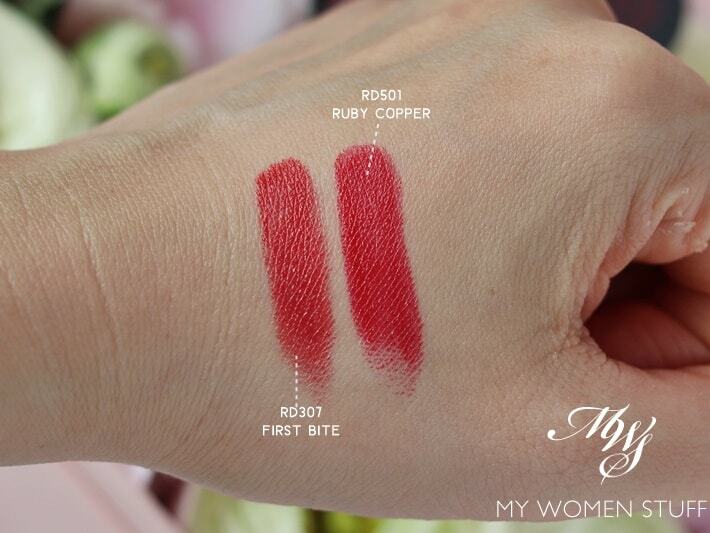 Back then when I bought my Ruby Copper (my favourite colour), it costs me only RM103. Now there is a price hike. I am not sure whether the price will change in recent time. A few months back they had this promo of two for RM 200. I picked up a pair when aeon had a double voucher day, so it worked out to about 80 each. I love a good bargain! I’d guess this rated better than Bobbi for you? first bite looks perfect! I will need to try it. Guerlain Rouge G are in a class of their own! I prefer bluish red lipstick because they make the teeth look whiter. Although last winter I got them bleached at the dentist (quite uncomfortable because it makes them sensitive during the procedure and a few hours afterwards which feels like someone giving you a proper blow with a fist!). But it’s so worth it and I will do it again. Now I can wear any lip color without considering tooth color. BTW: my teeth are a ‘believable shade of white’, not extremely white as a snow ball. Wow they are both gorgeous on you! I really like that slight metallic sheen. Thanks, one of them does have that slight sheen, while the other is more creamy. Both are nice though! You look really good in both lip colours. I love your brows too! I wish I could be bold enough to wear red lipstick. I have a few at home, but they tend to be neglected. Please urge us further….we need the push. Ok ok, I’ll wear a red this weekend…I hope I won’t wipe it off though before stepping out of home. Ha Ha. Thanks for the heads up in terms of prices in Japan. I was preparing to bring a lot of yen currency there and was worrying about how much I would be spending in a week. Ahh….I may still go on a shopping spree – can buy things that’s only available in Japan, e.g. Obagi Vit C, cute japan snacks and tea. I think they’re underrated because they aren’t terribly trendy – just solid classics. And in this world where trends rule the day, it slides into the shadows. It’s a pity, so we must remember to drag it out into the limelight once in a while! 😀 you’re lucky you can pull off orange lipstick! Gosh, I can’t and I have tried!